Macbook “full-featured” controller board: Boards hare arrived, waiting on component delivery (due Thursday). This will include demos of some new and lower-cost components which will eventually make their way into other boards. 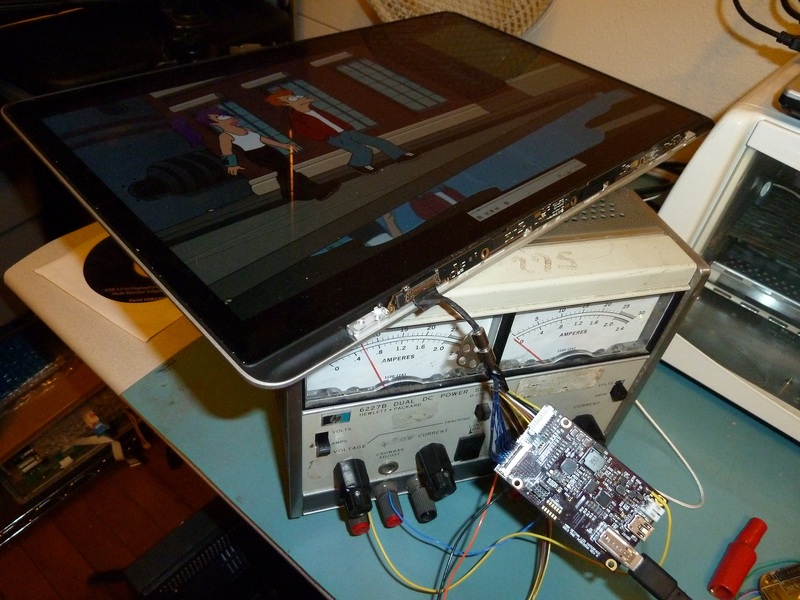 iPad “full-featured” controller board: On hold pending redesign for cost reduction and results of Macbook hardware evaluation (as much of the hardware is shared). Will leapfrog the Macbook and iPad boards until I am satisfied with how they work. Also am working on the software for this board. I’m really trying to get a USB firmware update utility built, but I’m new to the Kinetis platform so I’m having some trouble. Has anyone out there built a DFU loader for a KL25 that can share some pointers? Macbook camera board: I ordered a 2-layer version (inner layers are all GND) some weeks ago to test, and that worked fine. Now the proper 4-layer boards are in and I need to build one of those up. But I’m satisfied with the design in general so I should be releasing those documents as soon as I get the ambition. So that’s that. Not much to show at the moment. But hopefully that’ll change this weekend when I get some work done on the Macbook boards. Plus! I just this weekend got my new milling machine up and running! So expect some metalworking projects to start showing up from time to time. The Macbook board mostly works! Backlight driver is putting out on the low side of its designed voltage and the firmware is only complete enough to force everything on, but other than that, it seems to run pretty OK. Full post on this hopefully tomorrow. This entry was posted in Uncategorized on 2013-08-27 by mike. Looking forward to the awesomeness! Hows it going man, I just thought I would pop in and see how the projects were coming. I am still interested in the alienware display however you have other projects taking up your time so I understand of course. I was actually wondering if you may have some insight on a problem I am facing when it comes to hardware. I run 2560×1440 at 110htz (overclocked) and doing so exceeds the pixel clock limits put in place by AMD for my 7950s. There is a nifty piece of software that toastyX coded that circumvents all of the pixel clock limitations however requires that you run both Crossfire bridges when in 2 way crossfire (something to do with the bridge not being able to carry the ~450 pixel clock). I however want to up my setup to Trifire. Being that there are only the ribbon cables on the market I wonder if a Custom PCB solution like those for 3way SLI would fix that predicament. My question to you is do you think that such a solution would fix that particular limitation? The cards work fine with both connectors populated in 2 way crossfire, is there any reason we could not extend the bridge to the third card? Also where would I go to get such an item made? Is that a project you would be willing to tackle? You did a awesome work, is this a open source project? Sure is. I’m still working on preparing the source for release, though. I’ll try to get to it this weekend (hopefully) – I wanted to make some more progress on the software before I did so, but the going is slow. Is there something in particular you’re curious about in the short term?